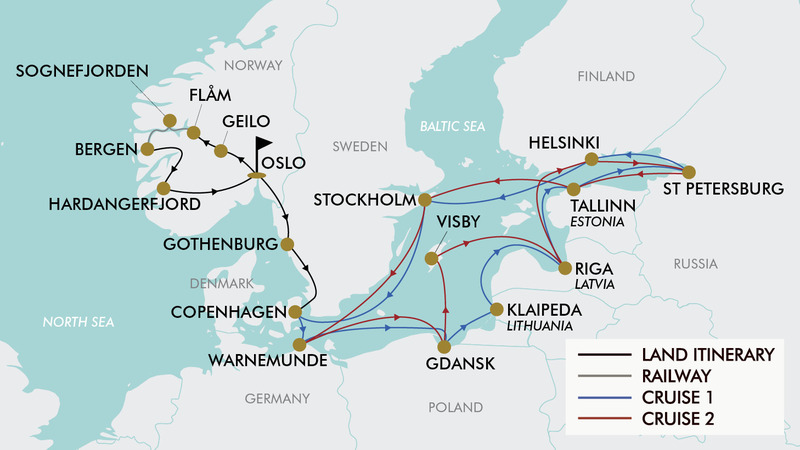 Whether you want to see the world's longest, deepest and most beautiful fjords, immerse yourself in breathtaking Baltic cities, or simply see the highlights of 10 incredible European countries, this 20-day package is for you. Start in Oslo, where you'll enjoy a city tour before embarking on a fjord cruise to see Sognefjord and the UNESCO-listed Nærøyfjord; ride the legendary Flam Railway from Flam to Myrdal; then explore Bergen, stopping to see the Hardangerjøkulen glacier and Voringfossen falls along the way, plus the cities of Oslo and Gothenburg. Upon arrival in Copenhagen, board your 11 night cruise on the MSC 'Poesia', a ship known for having a wide variety of daily activities, freshly prepared cuisine and excellent facilities, including a swimming pool and Broadway-style theatre shows. Admire ever-changing views as the ship makes its way to Warnemunde in Germany, the gateway to Berlin; fascinating Gdansk in Poland; charming Riga in Latvia; the medieval city of Tallinn; iconic St Petersburg, Russia; Helsinki, Finland’s ‘white city of the north’; immaculate Stockholm in Sweden and more bucket list destinations. Your trip includes return flights, six nights quality hotel accommodation, an 11 night Baltic Sea MSC Cruise, 38 meals and much more. Today depart from either Sydney, Melbourne, Brisbane, Adelaide or *Perth for Oslo! Fly with either Lufthansa, Swiss Airways, Singapore Airlines, Emirates, Etihad Airways or Thai Airways to name a few (subject to availability). Day 2 Welcome to Oslo! Upon arrival, you will be met and transferred to the hotel. This morning, meet your local guide and enjoy a 3-hour city tour. See the main highlights of Oslo, such as the medieval Akershus Fortress, the Royal Palace, the City Hall and Karl Johans Gate, the lively main street of the city. Afterwards, see the famous Frogner Park (entrance not included). In the afternoon transfer to Geilo, a town known for ski resorts and beautiful mountain trails. After breakfast transfer to Gudvangen. Upon arrival, embark on a ferry to Flam, where you will enjoy a Fjord cruise on the Sognefjord, the deepest fjord in Norway. During the cruise you will visit the stunning UNESCO listed Nærøyfjord, and the magnificent Aurlandsfjord. Take a moment to behold the awe-inspiring surrounding mountains, which are some of the most majestic in Norway. The Fjord cruise ends in the small village of Flam, nestled at the innermost part of the Aurlandsfjord, where you will disembark the ship before continuing to the Flam Railway Station to take the legendary Flam Railway. The Flam railway offers spectacular panoramic views into the Norwegian fjord landscape, making it one of Europe’s most popular railway journeys. The trains first call is Myrdal, where you will switch to the historical mountain train, Flamsbana. It’s a magical 1 hour train journey that takes you through some of the most impressive scenery in the world, including up close views of beautiful waterfalls and more. Afterwards you will arrive in Voss, where you will be transferred to the picturesque city of Bergen. This morning meet your local guide at the hotel and enjoy a half day tour (approx. 4 hours) of Bergen, Norway’s second largest city. Enjoy a guided walk along the famous UNESCO listed colourful Bryggen Wharf, once a centre of the Hanseatic League’s trading empire. Next visit the picturesque Fish Market in Bergen, one of Norway's most visited outdoor markets. The afternoon is free at leisure to explore this beautiful city on your own. Travel today to Oslo via the Hardangervidda Mountain Plateau, the largest plateau of its kind in Europe. One of Norway’s largest glaciers, Hardangerjøkulen, is located here. Make a photo stop at the impressive Voringfossen falls, one of the highest waterfalls in Norway. Continue along the picturesque Hardangerfjord, the fourth longest fjord in the world, and the second longest fjord in Norway. Arrive in Oslo in the evening. After breakfast travel to Copenhagen. On the way, enjoy a stop in Gothenburg, a major city in Sweden situated off the Göta älv river on the country’s west coast. An important seaport, it’s known for its Dutch-style canals and leafy boulevards, such as the Avenyn, the city’s main thoroughfare, lined with many cafes and shops and the Liseberg - a popular amusement park (entrance not included). Afterward continue your journey, to the Danish capital. During the drive, you will cross the Oresund Bridge, a combined railway and motorway bridge across the Oresund Strait between Sweden and Denmark. The bridge runs nearly 8km from the Sweedish Coast to the artificial island Peberholm, before diving below the sea level, switching to the Drogden Tunnel, which connects Peberholm to the Danish Island of Amager. Enjoy today a city tour of the city with a local guide to see the main sights of the Danish capital. Drive down Hans Christian Andersen Boulevard, which runs past the Tivoli Gardens, a world-famous amusement park. Cross the picturesque canal and drive past the Christiansborg Palace, the seat of the Danish Parliament. Pass the beautiful old Stock Exchange and see Kongens Nytorv with its Royal Theatre. Continue to Nyhavn, a street well known for the variety of its nightlife, before stopping at the Amalienborg Palace, the Danish Royal Family’s winter residence. The tour continues to one of the most famous sights in Copenhagen and one of the symbols of the city, the Little Mermaid statue, and the Gefion Fountain, a large fountain on the harbour front in Copenhagen. It features a large-scale group of animal figures being driven by the Norse goddess Gefjon. Enjoy some free time before to be transferred to the cruise terminal to board your MSC Cruise. The cruise departs at 6:00pm. This morning the MSC ‘Poesia’ is docked in Warnemunde. If you join a shore excursion (not included), passengers can be taken by train from the port city of Warnemunde to Berlin. In Berlin, step back into the city's turbulent past at the Brandenburg Gate, once closed between East and West Berlin, then reopened in 1989 when the Berlin Wall came down. View the famous sculpture of Queen Nefertiti at the Egyptian Museum, or wander among the shops and cafes of the Kurfurstendamm and Unter den Linden, two of the city's historic boulevards. Tourists staying at port can stroll past the fishermen's cottages on the old Alter Strom harbor. When you arrive in the Bay of Gdansk, you arrive into one of the most fascinating regions of the Baltic Sea and Northern Europe. Gdynia is steeped in nautical history. Stroll the beautiful waterfront before heading to nearby Gdansk, the largest city in northern Poland (not included). For a taste of local life, walk along bustling Long Market, lined with delicious cafes and eclectic boutiques. See the sights of the historic Old Town, which was restored after being destroyed in World War II. Visit St. Mary’s Church – one of the world’s largest brick cathedrals – or perhaps explore the Maritime Museum for a glimpse into the past of this ancient port city. The most northern ice-free Baltic seaport is also Lithuania's third-largest city. The city dates back to the construction of the castle of Memelburg at the mouth of the Dane River in 1252. Visit some of the local museums to learn about the fascinating history, or go to one of the art exhibitions held throughout the year. This port in the Baltic region has charming 17th-century streets and a medieval old town. Optional shore excursions (not included) visit the historic sites of the old town, including 13th-century St. George's Church and Livonia Knights' Castle, now an art and history museum. However, wandering the crooked streets on your own is one of the many pleasures of this city. Tallinn, Estonia’s compact, buzzing capital has been shaped by nearly a millennium of outside influence. With its enchanting heart surrounded by medieval walls, the historic town was founded in the 13th century and reflects the many influences since that time. Cobbled streets, Gothic architecture, and gourmet restaurants abound in the magical part of the city. This city along the Neva River embodies some of Russia's greatest treasures, and the MSC ‘Poesia’ will be docked overnight to allow passengers time to see the myriad of sites. A few notable attractions include the famous masterpieces at the Hermitage Museum, the baroque-style Winter Palace, St. Isaac's Cathedral with its 300-foot gilt cupola and the Bronze Horseman, a monument to Peter the Great. Today enjoy the day free at leisure relaxing onboard or exploring more of this beautiful city on your own. Finland's national capital is a lively, neoclassical city. The most obligatory site here is the tremendous Temppeliaukio Church, carved from solid stone. Popular excursions (not included) cover the Senate Square, the Lutheran Cathedral, Sibelius Monument, Finlandia Concert Hall, market square and Esplanadi Park. This immaculate Swedish city sprawls across more than a dozen islands connected by bridges. The best half-day shore excursions (not included) tour Gamla Stan, or old town, with its narrow cobblestone streets and buildings that date to the 17th and 18th centuries. Stops typically include Stortorget Square and its historic stock exchange; the hall where Nobel Laureates are honoured; the great warship Vasa; and the Royal Palace to watch the changing of the guard. A trip to Drottningholm Palace, which houses a splendid working 18th-century theatre, also is popular. After breakfast onboard disembark the cruise and make your own way to the airport for your return flight to Australia (transfer not included). Please note, some flights may arrive in Australia +1 or +2 days later. This morning, meet your local guide and enjoy a 3-hour city tour. See the main highlights of Oslo, such as the medieval Akershus Fortress, the Royal Palace, the City Hall and Karl Johans Gate, the lively main street of the city. Afterwards, enjoy a walking tour through the famous Frogner Park (entrance included). In the afternoon transfer to Geilo, a town known for ski resorts and beautiful mountain trails. After breakfast transfer to Gudvangen. Upon arrival, embark on a ferry to Flam, where you will enjoy a Fjord cruise on the Sognefjord, the deepest fjord in Norway. During the cruise you will visit the stunning UNESCO listed Nærøyfjord, and the magnificent Aurlandsfjord. Take a moment to behold the awe-inspiring surrounding mountains, which are some of the most majestic in Norway. The Fjord cruise ends in the small village of Flam, nestled at the innermost part of the Aurlandsfjord, where you will disembark the ship before continuing to the Flam Railway Station to take the legendary Flam Railway. The Flam railway offers spectacular panoramic views into the Norwegian fjord landscape, making it one of Europe’s most popular railway journeys. The trains first call is Myrdal, where you will switch to the historical mountain train, Flamsbana. It’s a magical 1 hour train journey that takes you through some of the most impressive scenery in the world, including up close views of beautiful waterfalls and more. Afterwards you will arrive in Voss, where you will be transferred to the picturesque city of Bergen. This morning meet your local guide at the hotel and enjoy a half day tour (approx. 4 hours) of Bergen, Norway’s second largest city. Enjoy a guided walk along the famous UNESCO listed colourful Bryggen Wharf, once a centre of the Hanseatic League’s trading empire. Next visit the picturesque Fish Market in Bergen, one of Norway's most visited outdoors markets. The afternoon is free at leisure to explore this beautiful city. After breakfast travel to Copenhagen. On the way, enjoy a stop in Gothenburg, a major city in Sweden situated off the Göta älv river on the country’s west coast. An important seaport, it’s known for its Dutch-style canals and leafy boulevards, such as the Avenyn, the city’s main thoroughfare, lined with many cafes and shops and the Liseberg - a popular amusement park (entrance not included). Afterward continue your journey, to the Danish capital. During the drive, you will cross the Oresund Bridge, a combined railway and motorway bridge across the Oresund Strait between Sweden and Denmark. The bridge runs nearly 8km from the Sweedish Coast to the artificial island Peberholm, leading to the Drogden Tunnel which connects Peberholm to the Dainish Island of Amager. Enjoy today a city tour of the city with a local guide to see the main sights of the Danish capital. Drive down Hans Christian Andersen Boulevard, which runs past the Tivoli Gardens, a world-famous amusement park. Cross the picturesque canal and drive past the Christiansborg Palace, the seat of the Danish Parliament. Pass the beautiful old Stock Exchange and see Kongens Nytorv with its Royal Theatre. Continue to Nyhavn, a street well known for the variety of its nightlife, before stopping at the Amalienborg Palace, the Danish Royal Family’s winter residence. The tour continues to one of the most famous sights in Copenhagen and one of the symbols of the city, the Little Mermaid statue, and the Gefion Fountain, a large fountain on the harbour front in Copenhagen. It features a large-scale group of animal figures being driven by the Norse goddess Gefjon. Enjoy some free time before to be transferred to the cruise terminal to board your MSC Cruise. The cruise departs at 6:00pm. This morning the MSC ‘Poesia’ is docked in Warnemunde. If you join a shore excursion (not included), passengers can be taken by train from the port city of Warnemunde to Berlin. In Berlin, step back into the city's turbulent past at the Brandenburg Gate, once closed between East and West Berlin, then reopened in 1989 when the Berlin Wall came down. View the famous sculpture of Queen Nefertiti at the Egyptian Museum, or wander among the shops and cafes of the Kurfurstendamm and Unter den Linden, two of the city's historic boulevards. Tourists staying at port can stroll past the fishermen's cottages on the old Alter Strom harbour. Today the ship is tendered in Visby, a city made for walking and stopping for a coffee or a piece of cake. Whether climbing the ramparts of the surrounding walls, or walking the maze of sloping cobbled streets, you'll find plenty of things to see and do. An optional shore excursion (not included) will take you to the historical centre if you are interested in discovering the history of this Island city. Please note: some flights may arrive in Australia +1 or +2 days later. Travel offer is valid for travel on selected dates until the 22nd of August 2020. Please note: 22nd August 2020 departure date uses an alternative cruise itinerary. Please ensure the departure date you have selected matches your preferred itinerary. Please note: Dates/months with a * incur a land high season surcharge of $100 per person. - Stopover packages are available for post tour only. - Oslo (Pre Tour): $270 per room including breakfast. - Visa fees and requirements (No visa is required for Europe if travelling on an Australian passport). Land: Recommended at €5 (approx. $8 AUD) per person, per day, payable on tour. Cruise: €10 (approx. $16 AUD) per person/day payable onboard at the end of the cruise. In spring, the days get longer, and the temperature rises slowly; the first warm days, more likely in the second half of the April. By mid-May, the maximum temperatures hover around 20/22 °C. Summer in the Baltic area is a pleasant season, since the maximum temperatures hover around 21/22 °C, which means that they are suitable for outdoor activities. Nights are cool, with minimum temperatures around 11/12 °C. August is one of the hottest months of the year in Oslo. Temperatures average 18°C with highs of 21°C. Gratuities (tips) are not included in the tour price for services of the tour leader (when available) and driver throughout the tour. The recommended tip for the tour leader and driver is €5 (approx. $8 AUD) per person, per day, which will be collected whilst on tour. Please note: Passengers who are not Australian citizens must check with the respective consulate or visa agency to determine what their visa requirements are and what personal identification is required. It is also important to note, some areas of employment such as journalism, government authorities and charity organisations may have additional restrictions in applying for Visas. This may, in turn, affect the type of application required. - 1st Change - $100.00 per person + any additional charges applied by the airline/cruise company/accommodation/other travel provider. - 2nd Change - $150.00 per person + any additional charges applied by the airline/cruise company/accommodation/other travel provider. - Subsequent changes - $250.00 per person + any additional charges applied by the airline/cruise company/accommodation/other travel provider. - Changes within 30 days of departure $350.00 person + any additional charges applied by the airline/cruise company/accommodation/other travel provider. - Changes within 14 days of departure $500.00 per person + any additional charges applied by the airline/cruise company/accommodation/other travel provider. - If the incorrect name has been advised to TripADeal, charges of $150.00 per person + any additional charges applied by the airline/cruise company/accommodation/other travel provider.